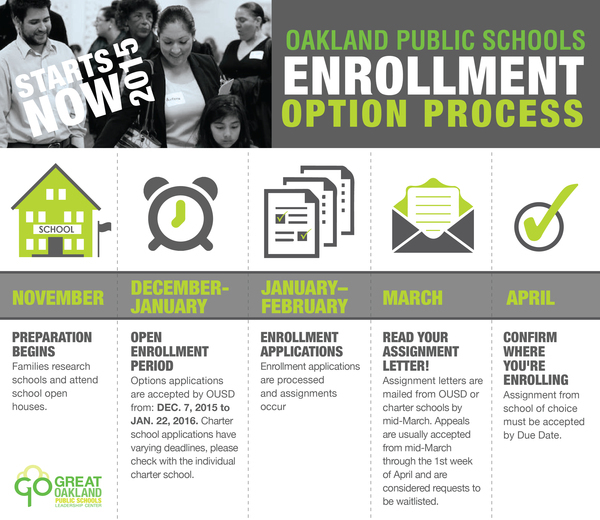 Over the next three months, Oakland families have the opportunity to explore all the public school options for their child during enrollment season. To help with the 2016-2017 enrollment process, we have compiled a number of resources in an enrollment map to assist families through the process. Families with transitioning students are wondering: How do I find the right fit for my child? And, when I do find the right place for my child, what do I do next? The number of choices and the enrollment process can be difficult to navigate and understand. So, we are offering tips for the enrollment process and what to look for on school tours. The graphic above shows OUSD’s enrollment process timeline from the open house/school tours that are occurring now through January, along with the enrollment window, which begins December 7 and ends January 22, the application processing in February and March, and finally notification on which school you were accepted to based on your preference. 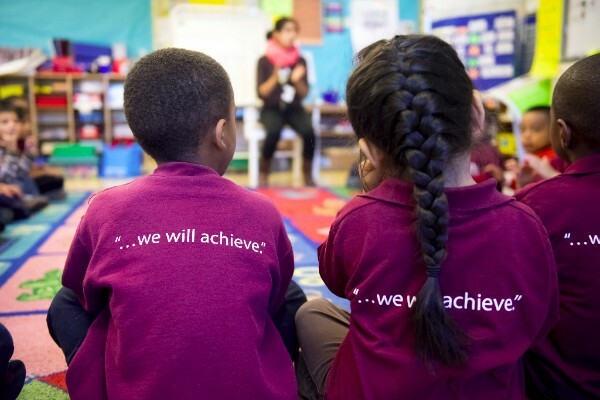 Each charter school operator has its own application deadline. 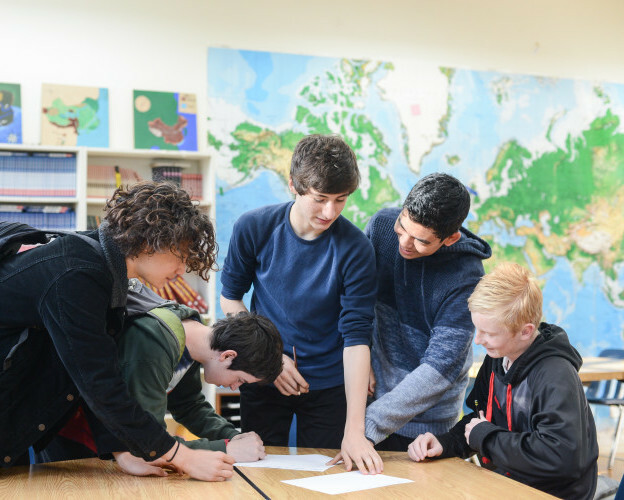 Charter school applications can be found on most of the school’s websites as well as application due dates, so check each charter website, which are linked on the enrollment map. * If you have a student with special needs, the process may vary from the one outlined here. We have tried to include information for families with special needs where possible. To find out more information about the special education programs and services, please contact schools directly. You know your child best and what his/her interests are. If you can, select a few schools to visit with your child. Those dates and times of tours can be found here. If your student has special needs, is in Programs for Exceptional Children, or has a 504 plan, call and ask the school what services they provide that fit your child’s needs. If your child currently attends an OUSD school, you may be able to get enrollment applications at the school or online. Charter school applications are available at the school or online. You need to prove your residency. Homeowners can bring their property tax statement. Current utilities bills are also accepted as proof of residency. Make sure you have filled in all the required information. Currently, siblings of current students at the school are given preference followed by neighborhood students; all other students are placed in a digital lottery. You have until April to confirm your child’s enrollment. 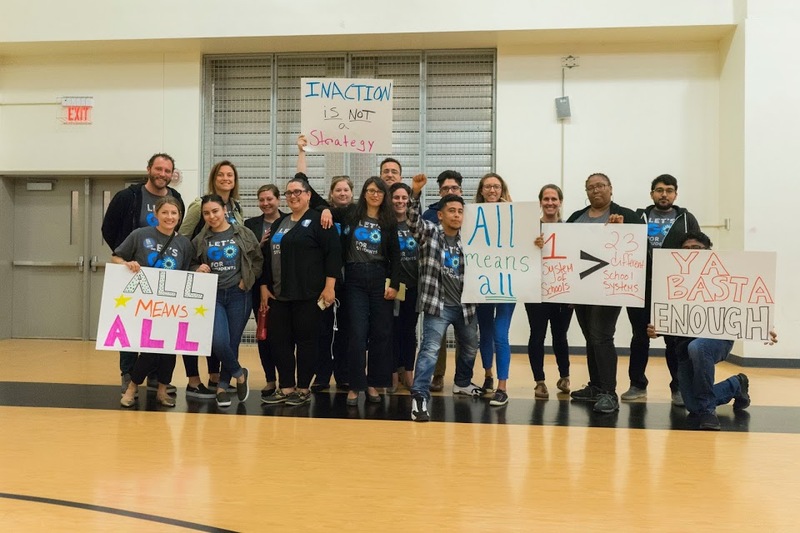 If you are unsatisfied with your OUSD selection, you can appeal the decision. Appeals are processed through OUSD’s student assignment center. As you take your school tour, watch how kids interact with teachers and other educators. Also watch the interaction among the kids. Are the kids having fun? Are they engaged? If you have a student with special needs, ask if the school has the programs that fit your child’s needs (physical, emotional social, etc). How is the program staffed? After school programs: Are they free or paid? Is there a waiting list? Programs offered at schools may vary from year to year. Ask the district or school which programs will be offered next year. OUSD’s has an enrollment section on its website that can be found here, and the 2016-2017 catalog is available here. Charter operators also have enrollment sections on their websites.